This is not an ad for Toyota. It's a photo of a 4.8-meter crocodile that was shot and killed earlier this week in the small Australian community of Palumpa. The scene was photographed by Jacob Brant, who sent the image to NT News. ABC News then confirmed its authenticity with local Wildlife Ranger Tommy Nichols, who literally captures crocodiles for a living. 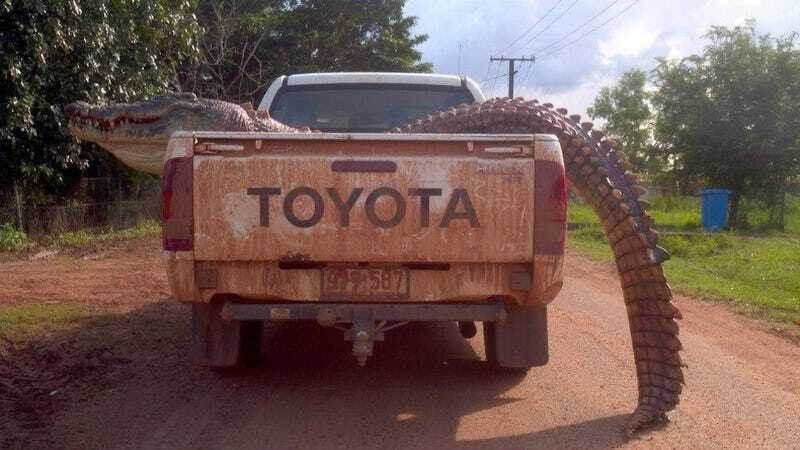 When situations warrant, Nichols will actually dispatch trouble crocs; according to him, this massive reptile had been menacing local school children. And here's what's really wild: crocodiles of this size aren't even that rare in Palumpa. What's more, saltwater crocodiles like this one have been known to reach up to 7 meters in length. This thing was big – but it was still more than six feet shy of record-breaking proportions. Just let that sink in for a minute. More info at NT News.